Bullying has become a major problem across the country. 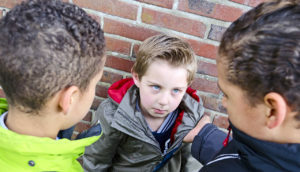 No one disputes the fact that bullying behavior exists, but what is often debated is how we should deal with bullying behavior. What should you do if you are confronted by a bully? Should you stand up to them? Should you walk or run away? What if you witness another person being bullied? The one point we can all agree on is that bullying is a societal and community issue, not just one individual’s problem. We must all be aware that bullying does indeed occur right in our own neighborhoods, schools and parks. Once we recognize that bullying does take place, we can approach putting an end to it collectively. Our strength is in our numbers. It is very difficult for one individual to stand up against a bully. In fact, often times the bullying behavior takes place by more than one person. The key is education and awareness. First and foremost we must be aware that bullying behavior does go on, and we cannot allow it. We cannot ignore it when it happens to us, and just as importantly, we cannot ignore it when we see it happening to another person. It is not so much a matter of interfering or trying to “take up” for the person being bullied, it is more a desire to stand with them side by side. Let them know they are not alone. As stated above, our strength is in our numbers. As more and more people begin to recognize the existence of bullying behavior and realize that we must work and stand together to change this behavior, we will begin to see a big difference in the safety and security of our children. As a public and community service Kicks Karate does offer free anti-bullying seminars to schools and groups. Please contact us at any of our locations for further assistance.